I spent much of my early restaurant-going life ordering chicken fingers, exclusively. It’s not that I was a particularly picky eater; I just knew that nothing else could possibly tempt a 12-year-old Kelly more than a plate of juicy chicken with honey mustard sauce, so I ordered them everywhere I went. Eventually I branched out and became the more adventurous eater that I am today, but every once in a while, I get that old craving. Yesterday, while visiting my family in Denver, I thought it would be fun if we made chicken tenders for dinner, so we fried up a batch. No need to adjust for high altitude, because these get you to heaven all on their own! Combine chicken strips and all the soaking ingredients in a plastic zip top bag. Knead the bag gently, so that all chicken surface is covered by the buttermilk mixture. Refrigerate at least an hour. Fill a frying pan about halfway with vegetable oil–just enough to float the chicken, but not quite deep enough to submerge it–and heat over medium-high. Meanwhile, combine all dredging ingredients in a large bowl. Remove marinade bag from fridge and set up a little assembly line: the open bag of marinaded chicken, the bowl of flour mixture, and a plate for the dredged but not yet fried chicken. 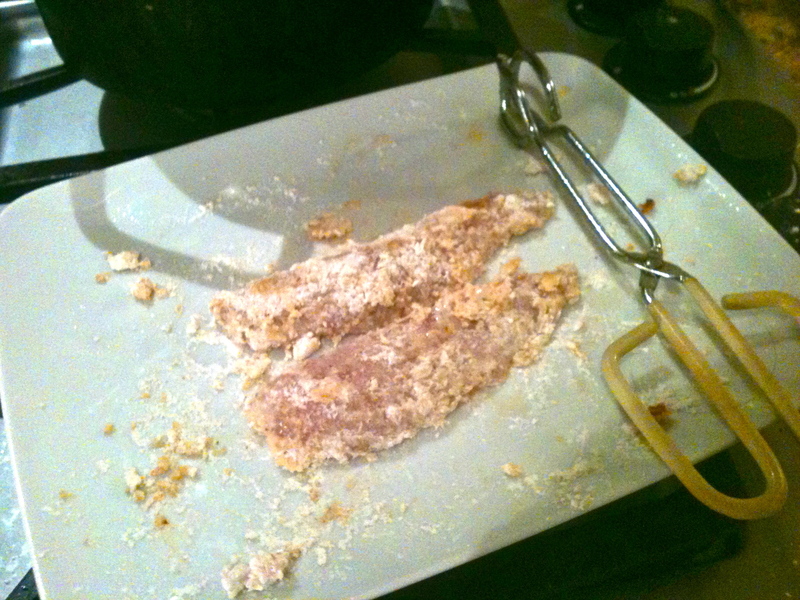 To dredge, take one strip from marinade bag, place it in flour mixture, and coat evenly. Then remove from mixture and place on the plate you’ve set out. You’re ready to fry the first batch once you have 3-5 tenders dredged (depending on how many fit comfortably in your pan). Test the oil by dropping a small clump of the flour mixture into it. If it sizzles and bubbles, it’s ready. Lay each tender in the oil, and be careful of splatter. Don’t crowd the pan–chicken tenders need their space, so you don’t want them touching each other at all. 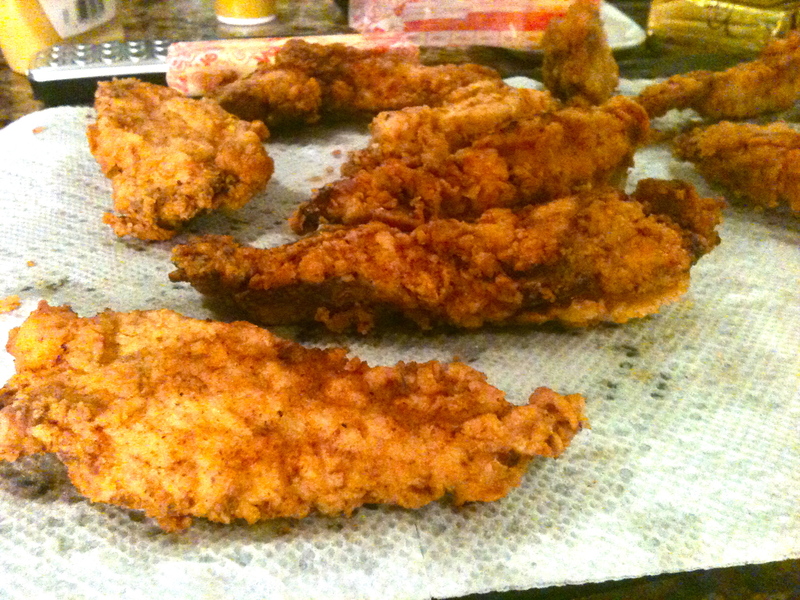 Cook time is about 10-13 minutes; flip tenders over at the halfway point. When they’re ready to be flipped, the undersides will be crispy and starting to brown. 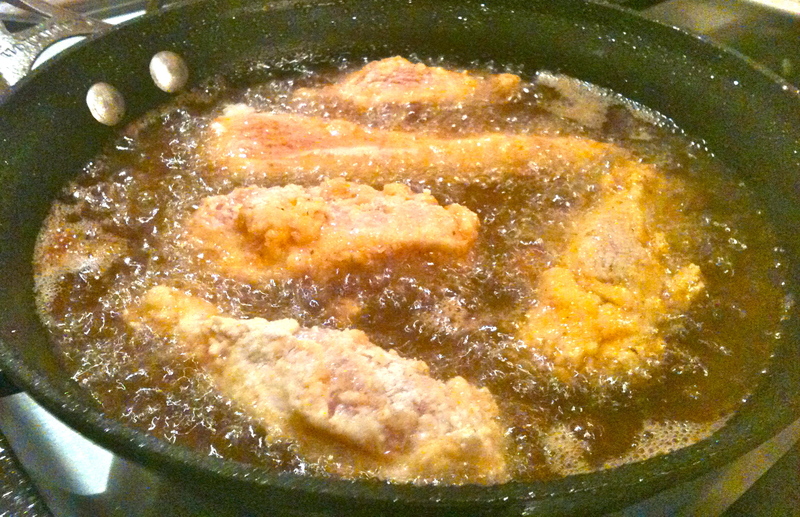 Carefully remove cooked tenders and place on a paper towel, to wick away excess oil. When you remove the first tender from the oil, cut it in half to make sure the middle is cooked and your cook time is sufficient. That’s it! These will blow your mind. 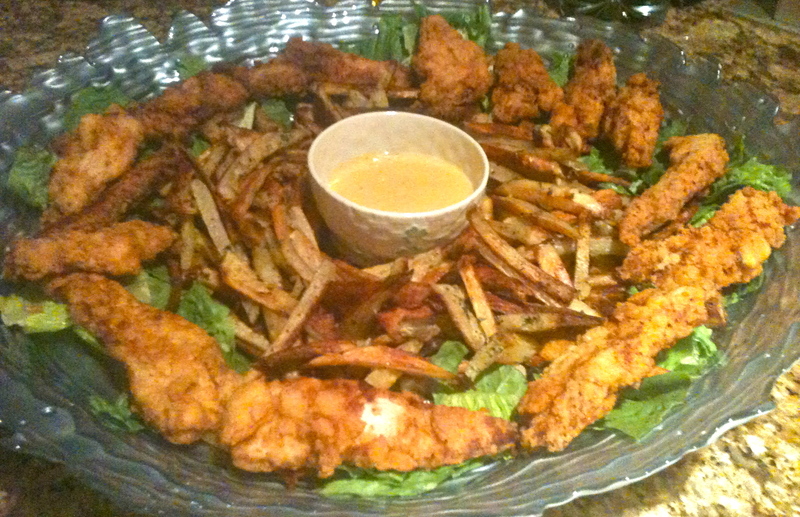 We served them on a bed of lettuce with honey mustard sauce and homemade baked french fries. Just dig that dramatic platter. The Westerly breeze carries the delightful fragrance of cooking chicken across our balcony and gently triggers our taste buds as it wafes through our Chicago apartment all the way from Denver. Can’t wait to try your recipe! They were unbelievable. Thank you Kelly! I love your posts. These were unbelievable. I really enjoy your recipes.